My name is Wang. My family live in the north of China. You must remember that China is a huge country. The North is very cold in winter. We have to wear plenty of clothes to prevent frostbite. When we go out we must put on several layers of clothing and we always wear headgear to cover our ears and necks as well as the top of our heads. We also wear gloves and big fur lined boots. These clothes, especially the boots are expensive and they get handed down to other children as we grow out of them. Kid’s feet grow so quickly they soon grow out of their boots. We do have a clever way of using socks so that boots can stay with their owner for longer. When we first get our boots we may wear three pairs of socks so that they fit. Then we go down to two, then one pair. Then sadly, we pass them on, or gladly, if we already have another pair of good boots waiting for us. If we are lucky one pair of boots will last one child a whole winter, before they get passed on to the next wearer. I remember one year when I was eleven years old I got a pair of boots from my neighbour who was twelve. I was used to getting his boots and clothes when he grew out of them. I looked at them. They were much worn. He must have had them from someone else first. Usually his things were all right; they were not too worn out, but these boots were quite tattered. I was cross. I would be expected to wear these old boots for the whole winter. My mother told me that I must wear them carefully and look after them because she did not know where the next pair of boots would come from if I wore those ones out. She certainly could not afford to buy me a new pair. I hated those boots. I decided I would wear them out as quickly as I could, then she would have to get me a better pair. We used to walk to our village school every day. 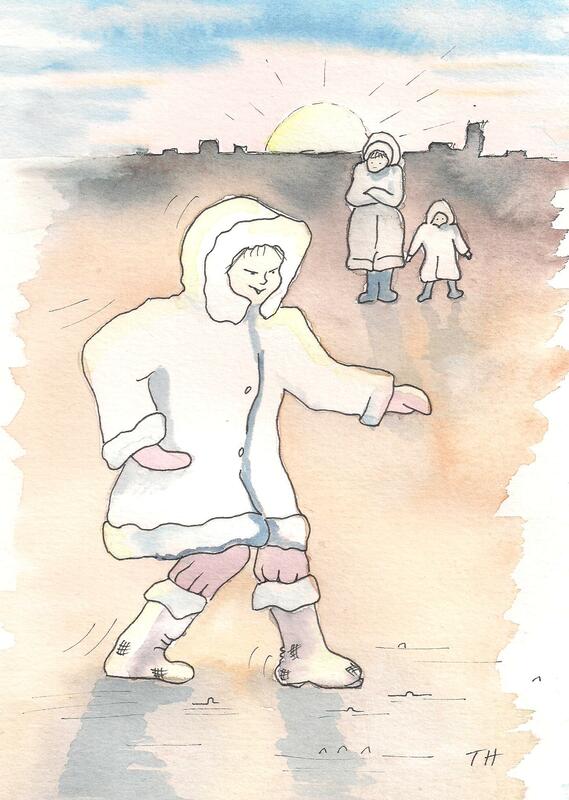 There would be ice on the road and every child knew you should not slide on the ice as it would wear out your boots. So I slid on the ice. I slid and slid. I showed off to the others. Some of them tried too. The older ones told us not to slide as our boots would wear out and we would get frostbite. I knew an old neighbour who had frostbitten hands. He had lost two fingers. The other children stopped sliding but I carried on. Finally I managed to wear a hole in my boots. I felt triumphant. Now my mother would have to get me another pair of boots. I showed the hole in my boot to her. She just looked at me. “Well what do you want me to do about it?” she asked after a long wait. My mother made me mend my boots with stinking fish glue and some old leather from a pair of worn-out boots. The mend hurt my foot and gave me blisters. After two weeks of watching me limp my mother took my boots and re-mended them herself, so that they didn’t hurt me any more. I was always careful to look after my boots and clothes after that. I made sure I handed them on in good condition to the next person. I did learn from my mistakes. My mother said it’s all right to make mistakes as long as we learn from them. In what way did Wang refuse correction? What does it mean ‘to be your own worst enemy’? Can you think of something you have done after you were told not to do it, and it caused you a problem? Can you think of a time when you learned from your mistake? Thank you Marc. It reminds us all not to be wasteful. I hope my stories speak to many people. It is good to know this one spoke to you. It is partly about not wasting the world’s resources and about other things too. Thank you so much Shubhra. This is exactly what I am hoping for – that people will discover and use my stories. If you can spread the word! i jux entered this site when i was searching to stories for primary school children and there i found stories for all ages there i found u. I really like ur stories. Every time I come to yogastories.wordpress.com there is another exciting article up. One of my friends was talking to me about this topic a few weeks ago. I think I will e-mail them the url here and see what they say.